NASA's InSight spacecraft landed down safely on Monday, to discover the deep interior of the Red planet Mars after its six and half month and about 480 million kilometers journey. 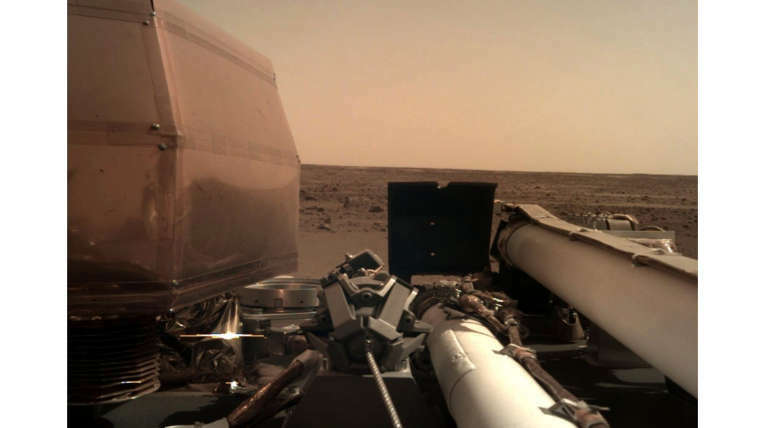 InSight is being followed to Mars by MARCO - Mars Cube One which is mini-spacecraft attempt to relay data about Mars atmosphere and lands. It will detect geophysics signals about the planet's heat, quakes. NASA InSight team worked for about five years to design and execute the mission. InSight is said to be inherited from Phoenix spacecraft which landed on Mars on 2008. According to NASA, Mars is easy to land and is less likely to melt like Venus or Mercury. InSight chief scientist Bruce Banerdt said: "The small details in how planets evolve are what we think make the difference between a place like Earth where you can go on vacation and get a tan, and a place like Venus where you'll burn in seconds or a place like Mars where you'll freeze to death". CNN reported InSight cruised 301223981 miles at a speed of 6200 mph followed by two cube satellites. Lori Glaze, acting director of the planetary science division quoted "We've studied Mars from orbit and from the surface since 1965, learning about its weather, atmosphere, geology and surface chemistry.Now we finally will explore inside Mars and deepen our understanding of our terrestrial neighbor as NASA prepares to send human explorers deeper into the solar system,"